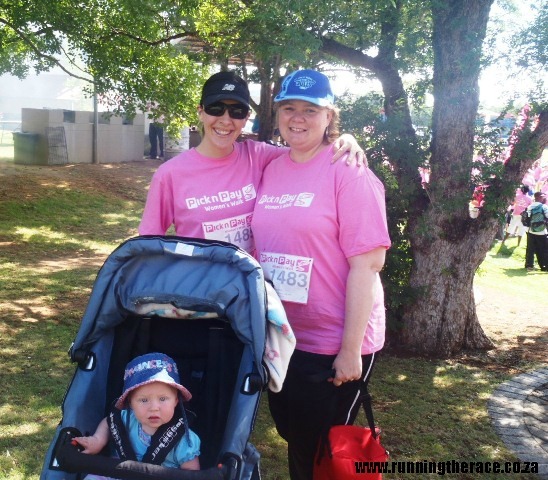 This weekend we participated in the Bloemfontein leg of the Pick n Pay Women's Walk. What made the event extra special, was the fact that my varsity roommate joined Baby Girl and me to make it a girls' morning out - love! The Pick n Pay Women's Walk is an annual 5 km event with several country wide legs in aid of the Pink Drive. Cause Marketing Fundraisers is a non-profit organisation which, through its Pink Drive campaign, is committed to improving breast cancer awareness and education in South Africa, plus providing and offering services to women across the country, particularly those who do not have access to information on breast health. What a blessing and privilege to be healthy and be able to contribute to this great cause! We had a lovely morning. Everything was superbly organised; we were spoiled with fun pink t-shirts, goody bags and medals; the route was safe and beautiful; and Grey College, who hosted the event on their school grounds, really went all out to make the day a success. For me the highlight of the morning was, however, sharing it with my roomie (and Baby Girl! ): Catching up, chatting and laughing away. We definitely hope to be back next year! That sounds absolutely wonderful, and for a great cause too!